Brad Schoener, 46, of West Chester, the beloved elementary band director for the Upper Darby School District, died March 19 at home, following a five-year battle with cancer. Mr. Schoener was born in Queens, N.Y. 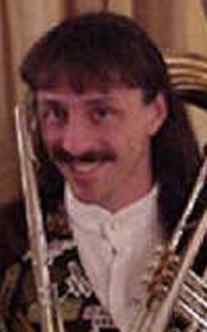 Known in the Philadelphia area as the Upper Darby Music Man, he earned many awards and accomplishments as both a teacher and a professional musician. Most recently, he was awarded the 2008 Butler-Cooley Excellence in Teaching Award by the Turnaround Music Association — recognizing teachers who have changed the lives of students and communities where they teach. Other awards include the nationally recognized 2007 Mr. Holland’s Opus Foundation Teacher of the Year Award, presented to him at Carnegie Hall in New York City. He was also honored by the Pennsylvania Senate and the Pennsylvania Recyclers Association in 2004 for composing “Reduce, Re-use and Recycle” to celebrate the students recycling efforts in song. Mr. Schoener was particularly proud of organizing a 1999 Mega Band of 800 players from the Upper Darby School District to perform at Veterans Stadium during a Phillies game. When not at school, Mr. Schoener was a composer and freelance musician. He created hundreds of arrangements and compositions for young bands, produced them and began Schoener Custom Music. While serving as a guest conductor and artist-in-residence for many public school concerts since 1992, he also managed to serve his church, Westminster Presbyterian, by forming an intergenerational band. His performances as a freelance musician were countless, playing with bands like Soul Survivors, Midnight Hour, The Exceptions, The Coup, and most recently, Masquerade. He also performed annually on bagpipes in full Scottish regalia for the Philadelphia Distance Run. He was a retired Scout Master for Boy Scout Troop 149 in West Chester. Survivors: Wife, Jennifer Weidman Schoener; son, Bradford Tyler Schoener of West Chester; daughter, Lauren Michelle Schoener of Washington, D.C.
Services: 11 a.m. Tuesday, Westminster Presbyterian Church, 10 W. Pleasant Grove Road, West Chester, and Life Celebration at 7 p.m. March 26 at the Upper Darby Performing Arts Center. Contributions: The Brad Schoener Music Fund, c/o Upper Darby Education & Cultural Foundation, 601 N. Lansdowne Ave., Drexel Hill. Please share your memories of Brad.